Another story from TJN’s Department of You-Couldn’t-Make-This-Stuff-Up. News is coming out that the government of Gibraltar is planning to sue Spanish newspaper ABC for defamation. Apparently the Gibraltarians take exception to the British Overseas Territory being depicted as a tax haven. 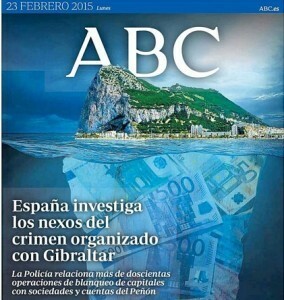 “THE Gibraltar government is suing a Spanish daily national over a front page story which pictured the Rock as an iceberg of dirty money. Can this be true? A couple of things surprise us about this story, beyond the fact that countries don’t sue newspapers (even if the reverse ain’t true). First, according to TJN’s financial secrecy index, Gibraltar scored a wholly unpleasant 79 out of 100 in 2013, placing it among the most secretive and least cooperative jurisdictions on the planet. The government of Gibraltar has never disputed these findings, so its claim against ABC strikes us as being akin to the Pope suing a newspaper for describing him as a Catholic. The charts below tell part of the story, but take a look at the fuller story here. Second, its not clear, to us at least, how a government can sue a newspaper for defamation. This sounds like the usual tax haven blowing-off stuff that we hear all the time from these bully boys. Perhaps Gibraltar’s Head of State should be consulted before her government kicks the hornet’s nest and triggers yet another diplomatic row between Britain and Spain. For the record, today’s blogger worked offshore in Jersey in the dim and distant. The instruction from senior partners in London was to direct the really, really dodgy business away from Jersey to, err, Gibraltar. For examples of some the types of dodgy business that’s been linked to Gib in the recent past look here, and here, and here, and here, and it goes on and on ad nauseam. One of our only slightly tongue in cheek definitions of a tax haven, or secrecy jurisdiction, is that it denies being one. “We are not a tax haven. They all say that.” And while we’re on the subject of tax haven deniers, take a look at the comments here from Jersey’s Geoff Cook, now Chief Exec of Jersey Finance, formerly responsible for wealth management at, whoops, HSBC. Some people have no shame. A slightly misleading headline: I suspect that the Gibraltar Government is taking action over the claim that it is home to “15 organised crime gangs”, which I think will prove difficult to defend. However, like you, I was unaware that it was possible to defame a government or country. As for “bully boys”, I think you’ll find they mostly occupy the territory over the border in Spain, with continued illegal incursions into Gibraltar territorial waters as the Spanish Government sticks to the absurd line that it somehow has a claim on a territory it ceded in perpetuity. That’s called “telling it as it is”, something that rarely happens in Spain. An extremely biased article. Why should a country not sue a newspaper when a grave injustice has been perpetrated. You call yourselves “taxjustice” but object to justice being sought, not very logical. It’s strange that the EU, The OECD and the FMI do not share your opinions about Gibraltar. Who is most credible, them or you? I have no doubts, and it’s not you. The Spanish government is known for being one of the most corrupt in Europe, made you an offer did they?